The first review of 2018 just so happens to come from the prior year. 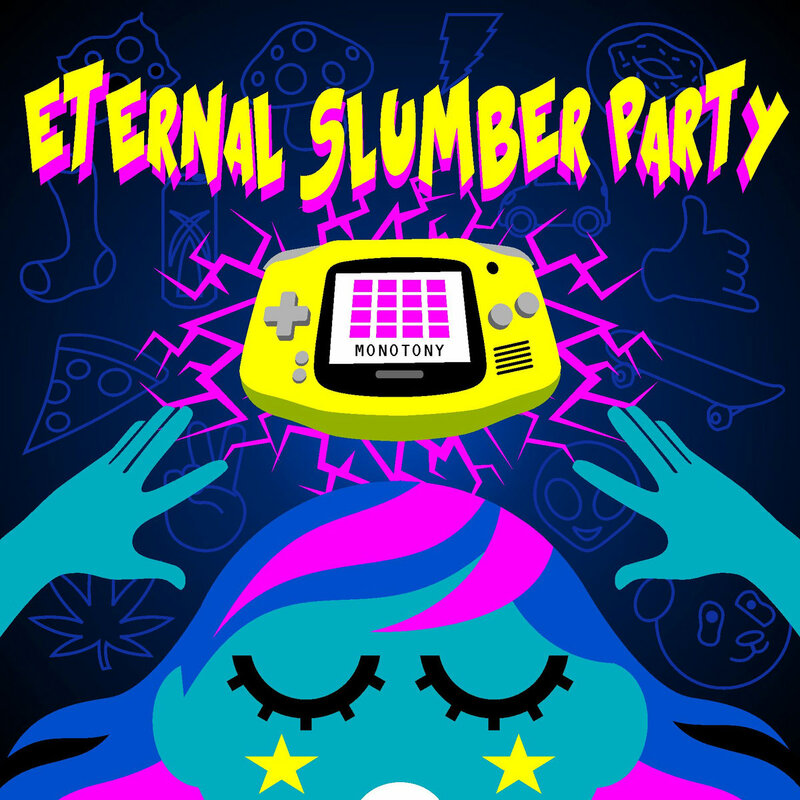 Monotony’s ‘Eternal Slumber Party’ was released during the middle of december 2017 and kindly shared by Paul of ‘Pain Perdu’. Like 2xAA’s album last year, ‘Eternal Slumber Party’ was recorded as a house set in Nanoloop 2.0, influenced by various genres; from juke & footwork, to dub, trap & progressive. Samples are also heavily used from a variety of different rappers and anime. The majority of tracks merge seamlessly together and because of this, I’m going to do short reviews of a few tracks from a select part of the album. We begin this review by starting on the well-named opening track, ‘Intro (Vert)’. The track instantly creates energy getting into the mix of things, with a variety of tasty arpeggios thrown about and rap samples peppered in. The strongest part from the get-go is monotony’s skill building sweet fills in the percussion. You really get feel of the footwork & trap genres here and they fill the majority of the album is colour and character. The 2nd track ‘SiK YoShi’ acts more as a bridge between 1 & 2, as it’s very directionless. However IT contains elements of both ‘Intro (Vert)’ and the third song, ‘Fated 2b Faded’. ‘Fated 2b Fade’ is a lot more melodic in its leads, whilst being extremely rhythmic in its percussion. Both parts play off against each other nicely; the lead warm, inviting & full of attack; the cymbals & ride, always shuffling and sizzling. ‘Fated 2b Faded’ ends up by mixing into the 4th Track, ‘Attacking The Corners’ with samples of character ‘Sayuki’ from ‘Initial D’. I’ll end this review by talking about one of my favourite parts off the album, the awesome tune, ‘No Comply til you die’, as it contains some of heaviest Nanoloop bass I’ve heard. I thought you’d wouldn’t be able to get a sound like that from the cart, however it seems ‘Monotony’ proved me wrong. I love the crunchy grind every time the track hits a peak of the bass as it really tries to tickle your ears. Due to this ‘No Comply til you die’ has pushed me to investigate this particular trick more in Nanoloop, and whether I can reproduce it. It was ashame I didn’t have enough time to get into Monotony’s Eternal Slumber Party as a lot of the track had potential to be in the top 10! At least I’ll have the CD to blast out in the car though.